I was camping last weekend when my group decided to duck into a local market for some ice. While they went to make their purchase, I walked around and decided to look for some curry sauce mix. I wasn’t planning on mixing up some Asian food during the camping trip — it’s part of an ongoing test I have to determine the quality of grocery store. I call it, the curry test. It’s a simple test — I just check to see if the store carries my brand of curry sauce mix (S&B) in the Asian food section. The test is simple and straightforward for my needs. It allows me to make some snap judgment on the quality of the grocery and the town it resides in. If a store has the curry, I generally tend to think that the store is well stocked in more cosmopolitan fare and perhaps serves a more diverse group of shoppers. Stores that don’t stock it seem incomplete in my eye and to some extent the community also seems to be missing something. 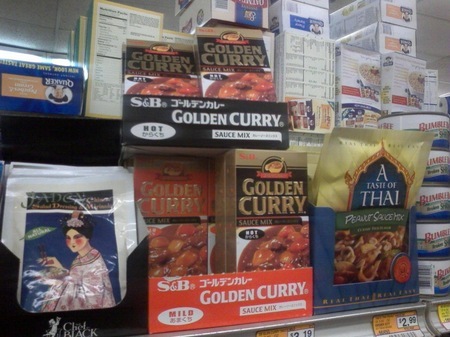 There may not be any rhyme or reason for why a store would stock curry. Population may be a factor with larger cities being more likely to have it. When I lived in Hancock, Mich., the smaller markets near my house didn’t have it, but the larger supermarket across the canal in Houghton did. The Thriftway market in tiny Dunsmuir, Calif. had it on the top shelf of a rather small ethnic food section. However, it wasn’t at the Graeagle Store in the even tinier Graeagle, Calif.
College town Chico has the sauce mix at most stores, but I almost wrote the town off because it wasn’t at the first store I checked (the college neighborhood Safeway on West Sacramento Avenue). Geography may play a factor too. While curry can be found in small rural communities, it can also be missing in larger cities, like Saginaw, Mich.
Perhaps the biggest surprise was the large chain supermarket in left-leaning Middletown, Conn. This is a town with a lot of diverse eateries, but I had to ship relief packages to my New England friends because their local store didn’t stock it. Graeagle, Calif. (pop. 831): No. Dunsmuir, Calif. (pop. 1,801): Check. Houghton, Mich. (pop. 6,878): Definitely at EconoFoods. Middletown, Conn. (pop. 48,030): Not at the Stop & Shop. Saginaw, Mich. (pop. 55,620): We tried the Kroger and settled for Thai curry mix. Chico, Calif. (pop. 83,791): Many stores do, but not the student neighborhood Safeway. Of course, this test is purely subjective. You may have some essential comfort food that you just can’t live without. For me, you’ve gone a long way to gaining a new customer if you’ve curry boxes on your store shelves. Image: Several boxes of curry sauce mix were for sale at the Thriftway store in downtown Dunsmuir, Calif. in Feb. 2009. This entry was posted in World at large and tagged Asian food, curry, food, S&B, shopping, tests. Bookmark the permalink.